The Great Hill is an open hilltop meadow with picnic tables, a quarter mile soft surface oval path (good for a jog), and lawn under a ring of stately trees. Frederick Law Olmsted and Calvert Vaux designed the Great Hill as a carriage concourse where visitors could enjoy commanding views of the Hudson River and the Palisades. With the passing of time and the growth of trees, the view slowly disappeared. In the 1940s and 1950s, the Great Hill was turned into a recreation area with bocce, tennis and volleyball courts and horseshoe pits, but by the 1980s, it was an abandoned and dilapidated ruin. 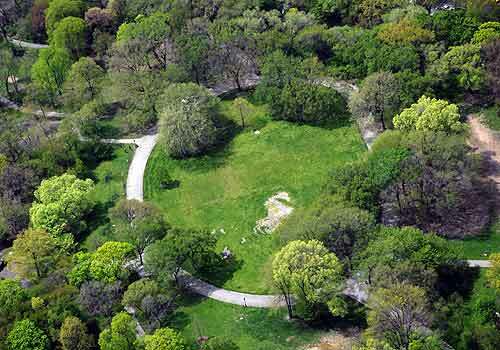 In 1993 the Conservancy replaced the crumbling recreation spaces with a lawn and oval track. In August 2009, an unexpected microburst devastated the area, felling so many of the trees in the area. Today the Conservancy has replanted many trees and the original views that Olmsted and Vaux had created have been restored. Now, the Great Hill is the site of picnics, lawn games, running or race walking on the oval track, and jazz concerts. Please note: Each winter, the Great Hill lawn closes for the season. This allows our turf crew to provide much-needed care for the landscape, ensuring that it will be ready for the influx of visitors come spring. For specific information about when the Great Hill lawn will re-open in the spring, please visit the Alerts and Closures page or follow us on Twitter. West Side from 103rd to 107th Streets.